Three children. Two words. One prophecy. They were snatched from their beds in the dead of night, when the world was covered in snow. Ten years on, Kate, Michael and Emma have grown up in a string of miserable orphanages, and all memories of their parents have faded. Arriving in the eerily silent Cambridge Falls, the children quickly realise there is something strange going on... With the discovery of an old leather book, an ancient magical prophecy is set in motion which will take them on an adventure of several lifetimes, to worlds outside their own. Only they have the power to save the town-and their own future. The action kicks off from the very start in this book, which brings excitement and adventure, with no room for boredom, even if you're a grumpy parent reading to your child, it will leave you wanting more. I thought it was great to not have this book in one POV, otherwise we wouldn't be really able to know what happened with Kate/Michael/Emma, if they were away from the main character. Although it did feel like Kate was the main main character, the book being told in 3rd person let us see the adventures her siblings were having, whether it was with dwarves, Screechers or the Dutchess. I thought that the time travel was a very unexpected aspect in the book, as the blurb says nothing anything about this at all. It was very well done, and thought it was really clever to have Kate connect with the book. Although the time travel was great, sometimes it got a bit out there, and confusing, especially with the multiple books. I think that these things need to be clearer, as this is a children's book. It was good that the book didn't have to detailed descriptions with the 'nightmarish' parts, like the Screechers and the monster the Dutchess had locked up. This brings a younger audience than if it did, which will certainty help the sales, which will make John Stephens a happy author. You will be gripping onto every word in this book, no doubt. There are many twists and turns in the book, both for the good and the bad. Adults and children alike will fall in love with this book, as it targets everyone's favourite aspects. They would want to keep reading and reading, even after they finished the book. Just another book proving how awesome middle grade is. I really enjoyed all the characters, though I occasionally wanted to tell Emma to stop being such a child. Since she’s only ten, I think it’s perfectly acceptable to act like a child, though. The siblings were all so different and unique. I loved that none of them felt dispensable and were all integral to the story. The side characters were great too. They were all really well developed and made the story complete. I really enjoyed all the intricacies to the story. I was kept guessing until the answer was right in front of my face, but there was still plenty of unanswered questions to leave room for the sequel. 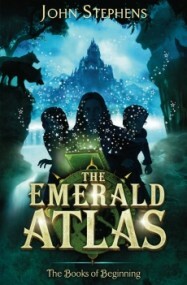 The Nutshell: The Emerald Atlas is a fast-paced, action-packed story full of risky situations and plucky young siblings. If you’re up for a crazy journey that’ll have you on the edge of your seat and keep you guessing, you should definitely get your hands on this one.